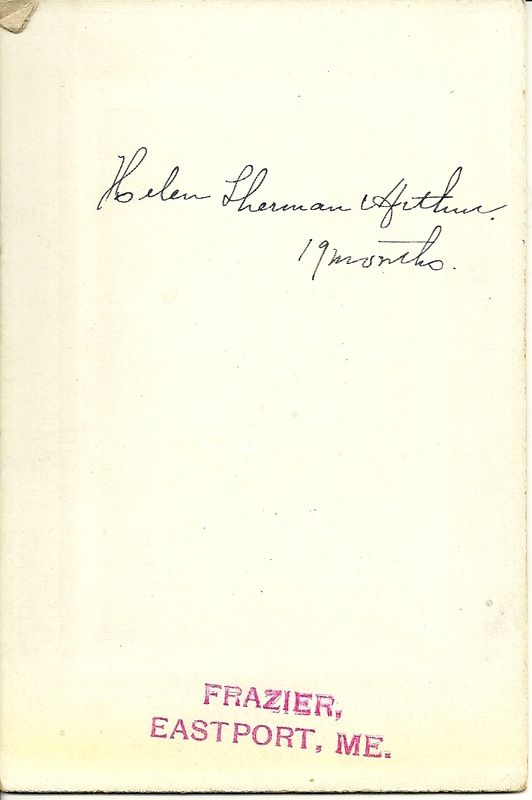 Circa 1901 photograph of young Helen Sherman Arthur, who was born November 28, 1900 at Lawrence, Massachusetts, the daughter of Albert Sherman Arthur and wife Mary Louise (Young) Arthur, who were born at Lawrence, Massachusetts on January 7, 1873 and 19 March 1876 at Eastport, Maine, respectively. The photograph was taken by the Frazier studio at Eastport, Maine, presumably while Helen was on a trip with her parents to visit family, though I believe both of Helen's Eastport grandparents had died by the time of her birth. Helen's paternal grandparents were David and Janet (Black) Arthur, both born in Scotland, possibly both at Paisley Mid Lothian, but who emigrated to the United States and settled at Lawrence, Massachusetts. Her maternal grandparents were Judson D. Young, who was born 2 February 1850 at Eastport, Maine, either to an Eastport couple or to a couple from one of the nearby New Brunswick islands, and wife Isabella G. (Robertson) Young, who was born 17 April 1850 in Scotland. I found Helen living with her parents in Lawrence, Massachusetts in the 1910 Census. In the 1920 Census, she's living in Lawrence with her father and his second wife Luella. 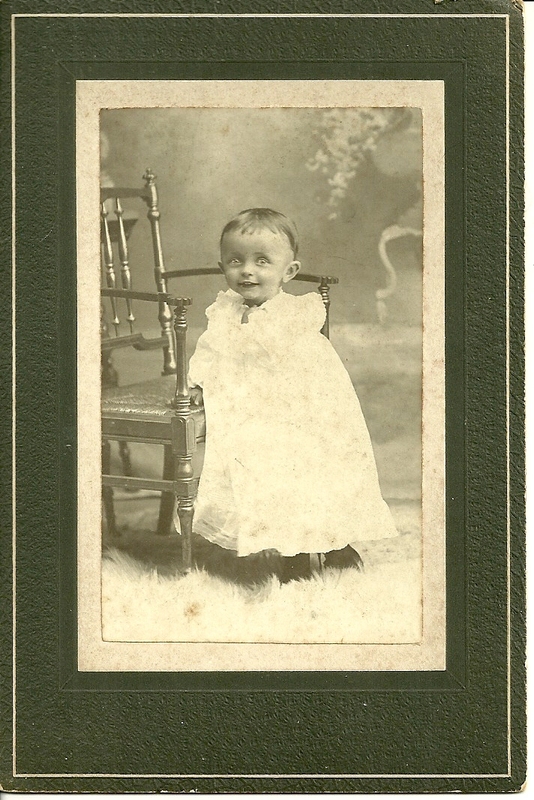 Mary Louise (Young) Arthur had died on November 13, 1911. I lost track of Helen after the 1940 Census of Boston, Massachusetts, where she was living with her father, shown as a druggist; no occupation was listed for her. I don't believe she married; hopefully a reader will come forward with news of her. 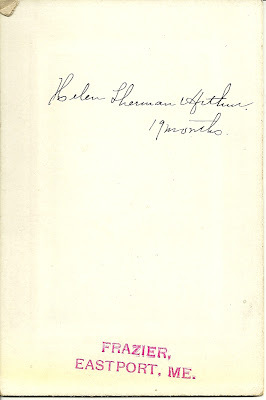 For more information, see the page at the Maine and Maritime Canada Genealogy network for Helen Sherman Arthur.